To keep this example simple and not worry about image rights, I’m going to try to find one of my own images from my previous Ghostery review. Go to the page that has the image you’d like to check. It could be any web page including a stock photo sample page. When you find the image, right-click and select Copy image URL. The option may be worded slightly different based on your web browser. Note: there are 4 ways to submit images. 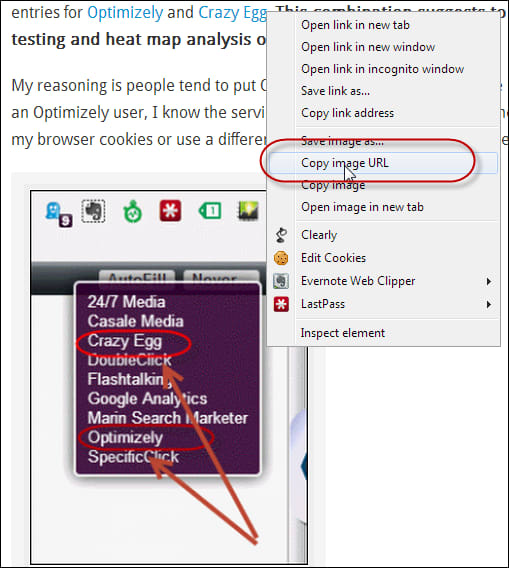 If the image isn’t on the web, you can upload one from your computer or drag the file onto the page. There are also browser extensions. Paste your image into the textbox. After a few seconds, TinEye will show the results. In this case, TinEye did not find any webpages with this image. This makes sense as the story is new and I don’t expect people to copy it. In some cases like stock photos, you may see high counts in the thousands. You can scroll down and see where the image appears. The image that produced the 1494 Results below was from one of the overused examples I mentioned. 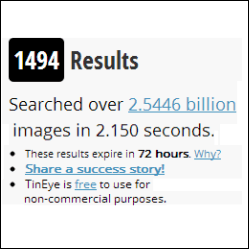 What is intriguing about TinEye is that the image you enter for your search doesn’t have to be an exact match, just close enough. Their algorithm is smart enough to find people who have altered images. This is evident on stock photos where some people try to alter the watermark or colors. If you read about their image submissions, you’ll see that many of the stock photo companies are their content partners which explain why they have billions of images in their database. In this method, I expect Google to find the same image because I don’t exclude my image files in my robots.txt file. Browse to the webpage that contains your image. Go to http://images.google.com/ and click the small camera icon to the right. Paste in the URL from Step 1. Click the Search by image button. As you can see, Google Image Search found my picture and provides the reference and text snippet. Whether you’re evaluating content for your own site or protecting your images, TinEye and Google Image Search can help find where else the image shows. However, you’ll have to use your judgment as to whether it’s the best photo for your story and audience.